One native grass (Hall’s bentgrass, Agrostis hallii) planted by plugs 12 inches apart, did not fill in after one year so it was removed and the plot seeded with purple needlegrass (Nassella pulchra) in fall 2011. 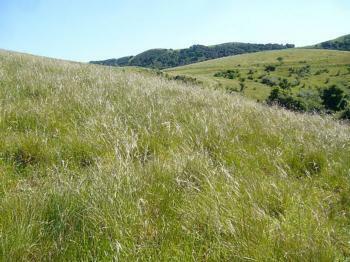 Purple needlegrass is the classic native California bunchgrass. 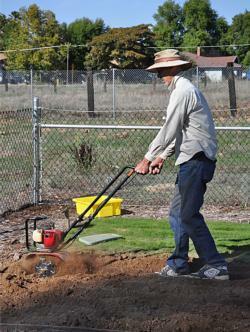 It is a cool season grass that goes dormant during the hot dry summer, reviving with cooler autumn weather and rains. 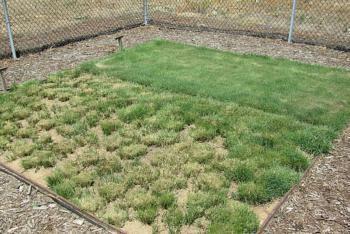 Purple needlegrass replaces Hall's Bentgrass, Agrostis hallii formerly in this plot. The Hall's Bentgrass did not fill in after one year and therefore would not make a good turf alternative. Removing the remains of the Hall's bentgrass from plot had to be done by hand with shovel and hammer. Once the bentgrass was removed, the area was rototilled to smooth out the soil. 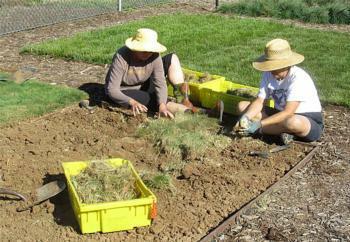 No amendments were added to the soil which had quite a few earthworms. 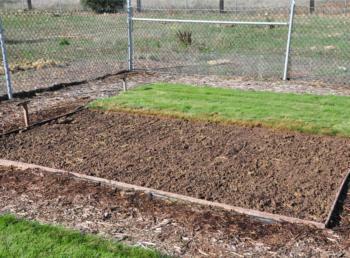 The finished, seeded plot on October 26, 2011.